The banner on a webpage is an instrumental piece in grabbing attention and letting your audience know what your page is all about. It's a clear refection of you so keep the word "professional" in mind. Banners come in various sizes and are often dictated by the layout of a site. For your portfolio site, you will be creating pages that are centered in a web browser and are 900px wide – a fairly basic layout, but perfect for our purposes and keeping it simple is the name of the game. Save as a JPEG and title it "banner_bg". 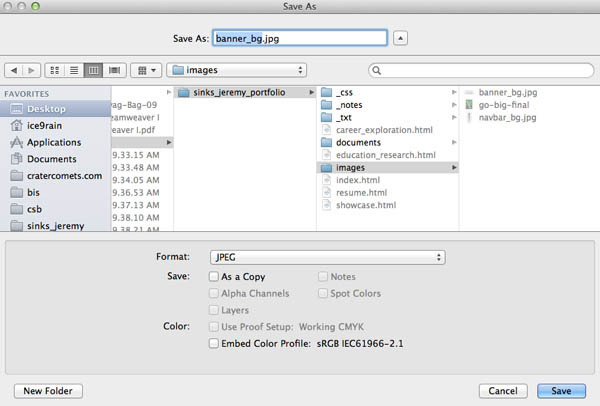 Save in the images folder in your portfolio folder. TIP: save both the .psd and .jpg files in your images folder so if you need to make a change later, you still have the original .psd file to modify. Take a quick note about where these styles are located. 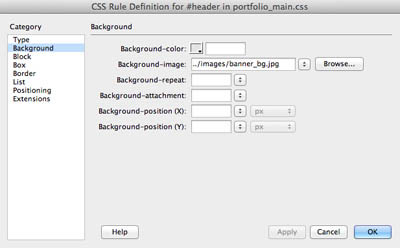 The global styles, or the styles applied to common elements (tags) for each page are housed under "portfolio_main.css". 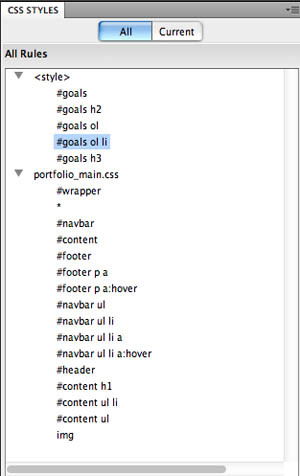 The styles applied only to index.html fall under <style> which consist of all the styling for the goals <div> tag. If your list doesn't look like image to right, you can easily move style around in the CSS Styles panel by clicking on the name of the ID or tag, and dragging it to the desired location. Just be aware that when you move styles to the external stylesheet "portfolio_main.css", these styles may be applied to other pages. Furthermore, the local styles you move in "index.html" are only applied to index.html, so you may end up with some duplicate styles in your other pages. To check to see if you have duplicate styles on other pages, open the rest of your pages in the portfolio. Select one to look at. Look at the CSS Styles panel and check to see if you have duplicate ID's or tags under <style> and "portfolio_main.css". In the next exercise, we will begin inserting and styling content for your portfolio pages, starting with the resume page.